Where Jason De Florimonte fell dead after being shot. 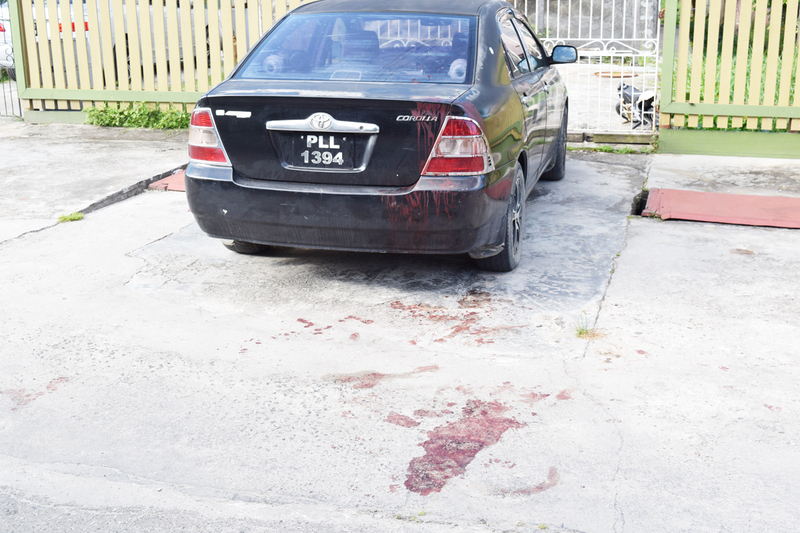 A 30-year-old driver was shot dead at around 01:00 hrs yesterday during a confrontation with his neighbour, who is the owner of the Tourist Villa Hotel in Fifth Avenue, Subryanville, Kitty. Jason De Florimonte of 96 Fifth Avenue Subryanville, Kitty, was shot four times after he allegedly confronted Erwin Bacchus, a licensed firearm owner, in the businessman’s hotel. De Florimonte fled outside and died a few feet from his front gate. Police have taken the businessman into custody. De Florimonte, who was a driver/salesman employed by Top Brandz Distributors, and who lived opposite the Tourist Villa Hotel, was said to have had a strained relations with Bacchus, an aunt of the slain man said. The victim was the father of three children. He was at the time living with a 24-year-old woman, Christine Rambarran, who is at the centre of the incident. Police said that the shooting occurred after De Florimonte and his 24-year-old girlfriend had an argument. According to a police press release, Terrance Newsun, a handyman, was at the hotel gate when he saw a commotion between the couple. When Newsun confronted them, De Florimonte allegedly attacked the handyman, who fled into the hotel, with De Florimonte in pursuit. Police allege that while in the hotel, De Florimonte turned his attention to the hotel owner, who shot the driver four times in the chest with his licensed firearm. The shot man died at the scene, while police took the shooter into custody. Some hotel employees claimed that De Florimonte had run into the hotel with two knives and was shot during an argument with the proprietor. Relatives of the slain man confirmed that De Florimonte and Rambarran were having an argument near their gate, when the handyman, who is employed at the hotel, intervened. They said that an argument ensued between the two men, and Bacchus, who has a licensed firearm, also got involved, after which gunshots rang out, leaving De Florimonte dead on the road. A blood trail, leading from inside the hotel to the roadway, was still visible when Kaieteur News arrived at the scene.